Earlier on Saturday, Al Jazeera aired a tape featuring a speech by Fatah al-Islam’s leader. He said Fatah al-Islam would fight “the Jews, the Americans and their loyalists”, an apparent reference to Lebanon’s government. On Friday, Hassan Nasrallah, secretary-general of Hezbollah, said in a televised speech that the country risked getting dragged into America’s war against al-Qaeda. Fuad Siniora, Lebanon’s prime minister, has defended the import of military supplies from the US, saying the supplies had been offered by several countries months ago. The Fatah al-Islam members fighting the Lebanonese Army in Tripoli this week included 50 terrorists with previous experience fighting in Iraq. Last week, the Lebanese army was in a furious battle against a militant group, Fatah al-Islam, whose ranks included as many as 50 veterans of the war in Iraq, according to Rifi. More than 30 Lebanese soldiers were killed fighting the group at a refugee camp near Tripoli. The group’s leader, Shakir al-Abssi, was an associate of Abu Musab al-Zarqawi, the leader of Al-Qaida in Iraq who was killed last summer. In an interview, Abssi confirmed reports that the Syrian government forces had killed his son-in-law as he tried crossing into Iraq to collaborate with insurgents. 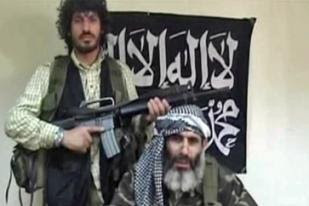 Militant leaders warn that the situation in Lebanon is indicative of the spread of fighters. “You have 50 fighters from Iraq in Lebanon now, but with good caution I can say there are a hundred times that many, 5,000 or higher, who are just waiting for the right moment to act,” Mohammad al-Massari, a Saudi dissident in Britain who runs the jihadist Internet forum, Tajdeed.net, said in an interview Friday.